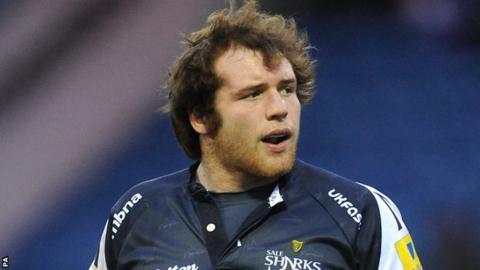 Sale Sharks prop Henry Thomas has expressed his frustration at being injured during his side's poor form. He has started twice this season for the Premiership's bottom side because of injury but is now fit again. "When you're on the sidelines, you're stuck in the gym all day," the 21-year-old told BBC Radio Manchester. "Watching the game you get very frustrated - it's hard watching your team lose and we've been doing that quite a lot in the last 12 months." He added: "Fair play to the lads as everyone's cracked down and we're on a bit of a roll now." Following his return to fitness, Thomas was the 24th man in the England squad against Ireland last Sunday, and says he hopes it will turn out to be a valuable experience. "It's been great training with the squad and getting to know those guys, starting to get a bit of experience from those top players playing on top of their game," he said. "That's where I aspire to be and my form here will prove whether I'm good enough."